The Galloway Station Museum and Travel Centre new exhibit space will be closed until April 7th for the construction of the final phase. The Edson and District Historical Society apologizes for any inconveinence. The newest edition to the Galloway Station Museum and Travel Centre gift shop. Edith Julia Bronson married an outlaw at the beginning of this century. This courageous pioneer woman bore her lawless husband, Fred Frye, nine children, drove a freight wagon 2,000 miles from North Dakota to BC on a six-year odyssey, endured loneliness, her husband's bootlegging, brawling, philandering and brutality, and in the end shot and killed him to protect herself and their children from his murderous rages. The sensational story hit the front pages of newspapers through BC. Yearly passes are now available at the museum. They make a perfect gift for the hard to buy for. 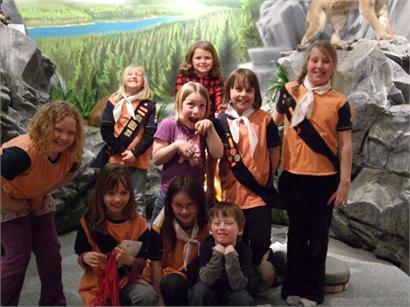 The Girl Guides and Brownies came to museum on the 20th and 21st to work towards their community badges. More than 40 people attended the two nights. The girls were very inquistive of the animals and train paraphernalia and asked lots of great questions to the staff at the Galloway. The girls learned about native animals, the trapping and industry and also played two games, I Spy and a "Guess What" game. Good luck earning your badges in the future! 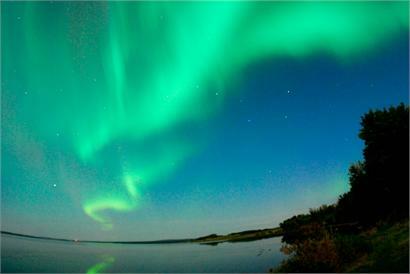 Chip Lake is located 18 km off of Highway 16, just north of Wildwood. The lake is shallow which provides an excellent home to more than 125 bird species. The endangered Whooping Crane as well as the Osprey choose the lake as nesting grounds. The lake also holds 7 islands, each with a unique aspect; Big Island, Spruce, Spud, Hat, Poplar, Archie's and Gravel. One Island holds an impressive blue heron colony. The lake was once a low lying meadow where bison would graze. One year the meadow flooded creating the lake we know now. The earliest recording of the lake is in 1865. The campground has 22 unserviced sites, with a playground, boat launch, gazebo and free firewood. $20.00 per night per sleeping unit. 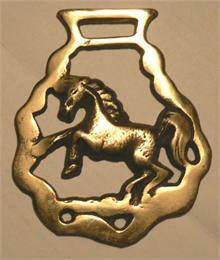 This is a horse brass. Take a long look at it and try to figure out what it could be used for. Stumped? Don't worry you aren't the only ones. Horse brasses are decorative additions to heavy horse harnesses that attach to a martingale (a strap that prevents the horse’s head from getting too high) that hangs down the chest of the horse. Originally used as amulets to ward off the 'evil eye' which brought bad luck they have now been used as decorations for heavy horse parades and are a common decoration in English and Irish Pubs.